Acadiana Outfitters, online at acadianaoutfitters.com, offers apparel and gear designed for the great outdoors. Acadiana Outfitters carries a varied collection of supplies for camping, hunting, fishing, travel, hiking, and any other outdoor activity. Acandiana Outfitters offers men's and women's footwear, eyewear and glasses, sportswear and apparel for men, women, and kids, camp gear, knives and tools, hunting gear, shooting gear, headwear, shoes, and more. Acadiana Outfitters carries top brands like Adidas, Benchmade, Browning, Sperry, Danner, Colman, Maglite, Codet, and others. But before you shop, get all the latest acadianoutfitters.com promotions, Acadiana Outfitters discounts, and Acadiana Outfitters coupon codes found here at RetailSteal.com. 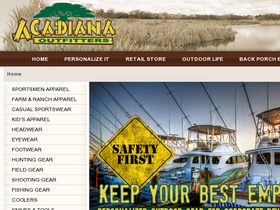 Acadiana Outfitters ships within the continental United States, Hawaii, Alaska, and Canada. Acadiana offers free standard shipping in the continental U.S. on select orders. See site for more information. Save 30% on your purchase from Acadiana Outfitters when using this coupon code. Click link to shop and save. Enjoy a 15% discount from Acadiana Outfitters using this coupon code. Click link to shop and save. Enjoy free standard shipping from Acadiana Outfitters on your purchase $199 more. Offer valid for purchases delivered within the continental U.S. Click to shop. Save up to 50% on the back porch bargains sale section at Acadiana Outfitters. Click link to shop and save. Save up to 50% on apparel and gear on sale at Acadiana Outfitters. Click here to shop and save. Go to Acadiana Outfitters and shop for sportsmen apparel starting under $10. Click link to shop and save.